Anti-bcl-2 is a mouse monoclonal antibody derived from cell culture supernatant that is concentrated, dialyzed, filter sterilized and diluted in buffer pH 7.5, containing BSA and sodium azide as a preservative. Small volumes of anti-bcl-2 antibody vial(s) may occasionally become entrapped in the seal of the product vial during shipment and storage. If necessary, briefly centrifuge the vial on a tabletop centrifuge to dislodge any liquid in the container`s cap. Certain products may require to ship with dry ice and additional dry ice fee may apply. bcl-2 is an integral outer mitochondrial membrane protein that blocks the apoptotic death of some cells such as lymphocytes. Constitutive expression of bcl-2, such as in the case of translocation of bcl-2 to Ig heavy-chain loci, is thought to be the cause of Follicular Lymphoma. Anti-bcl-2 has shown consistent negative reaction on reactive germinal centers and positive staining of neoplastic follicles in Follicular Lymphoma. Consequently, this antibody is valuable when distinguishing between reactive and neoplastic follicular proliferation in lymph node biopsies. 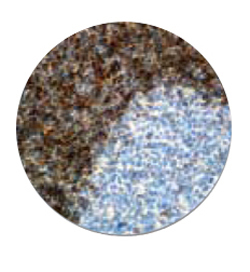 This antibody may also be used in distinguishing between those Follicular Lymphomas that express bcl-2 protein and the small number in which the neoplastic cells are bcl-2-negative. Anti-bcl-2 has been used as a predictive biomarker for recurrence of Cancer of the Breast and Non-Small-Cell Carcinoma of the Lung. NCBI/Uniprot data below describe general gene information for bcl-2. It may not necessarily be applicable to this product. Function: Suppresses apoptosis in a variety of cell systems including factor-dependent lymphohematopoietic and neural cells. Regulates cell death by controlling the mitochondrial membrane permeability. Appears to function in a feedback loop system with caspases. Inhibits caspase activity either by preventing the release of cytochrome c from the mitochondria and/or by binding to the apoptosis-activating factor (APAF-1). Subcellular location: Mitochondrion outer membrane; Single-pass membrane protein. Nucleus membrane; Single-pass membrane protein. Endoplasmic reticulum membrane; Single-pass membrane protein. Tissue specificity: Expressed in a variety of tissues, with highest levels in reproductive tissues. In the adult brain, expression is localized in mitral cells of the olfactory bulb, granule and pyramidal neurons of hippocampus, pontine nuclei, cerebellar granule neurons, and in ependymal cells. In prenatal brain, expression is higher and localized in the neuroepithelium and in the cortical plate.